Critical Resistance Oakland is a member of Stop Urban Shield, a broad coalition of organizations working to end Urban Shield, an annual militarized SWAT training and weapons expo that has taken place in Alameda County since 2007. Urban Shield brings together local, regional, and international police-military units to collaborate on new forms of surveillance, repression, and state violence. 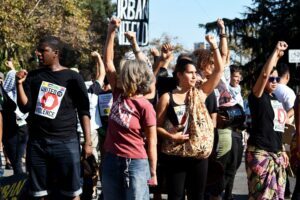 In 2014, Stop Urban Shield and broader community organizations and members built upon Oakland’s rich history of organizing against policing and for self-determination by forcing the City of Oakland to stop hosting Urban Shield. We are now working with the coalition to put a complete end to Urban Shield. 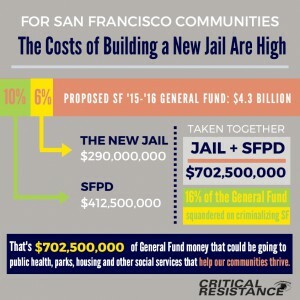 Critical Resistance Oakland is a cofounding member of the No New San Francisco coalition, which is halting jail expansion in San Francisco County. In 2015, CR-Oakland released “No New Jail in SF: The People’s Report”, a comprehensive report that exposes the human impact of the proposed jail. Read and download the report here. At the end of the year, CR-Oakland and the No New SF Jail coalition successfully defeated the proposal for a new jail in San Francisco at 850 Bryant St. Since then, we have been focused on making sure that new proposals to build a smaller replacement jail or a locked mental health facility—a jail by another name—do not move forward. To this end, CR developed a popular educational resource, “8 Steps Toward a Jail-Free San Francisco,” which has been used by decision makers as a tool to evaluate alternative proposals to a jail, and contributed to “The San Francisco Community Health Initiative,” a comprehensive people’s plan that prioritizes meeting social and economic needs as solutions to ending imprisonment. On October 28, 2016 a year of hard work paid off when the “Alternatives to a Jail Rebuild” community-city workgroup rejected the Sheriff’s two “mental health” jail proposals and endorsed non-jail alternatives instead. We will continue to pressure the County Supervisors to ensure that our victories are not undermined and that no new jails are constructed in SF, especially in the name of health and treatment. You can read the coalition’s platform here. Check out the coalition’s website for updates and ways to take action! We are part of a statewide network through CURB coalition (California United for a Responsible Budget), to oppose cage expansion throughout the state. Californian’s health and safety will not be improved with jail expansion. California county jails are inherently violent, poorly run, and wastes of taxpayer money. The public funds that are now used to police, convict and incarcerate people should be going to provide housing, education, health care & employment. Safe and healthy communities depend on mental health services, youth centers, supportive and affordable housing, and real opportunities in their communities; not cages. Check out Alternative Investments to Imprisonment, a tool which Critical Resistance developed to fight expansion and help make abolition common sense. Policing is failing Oakland. The Oakland Power Projects help Oakland residents invest in practices, relationships, and resources that build community power and wellbeing. By identifying current harms, amplifying existing resources, and developing new practices that do not rely on policing solutions, the Oakland Power Projects remind us that we can make our families and neighborhoods safe and healthy without relying on the cops. Learn more about the project and how to plug in here. Critical Resistance (CR) has been heavily involved in prisoner-led organizing to abolish solitary, from the first California prisoner hunger strike in 2011 to the 30,000-strong strike in 2013. Critical Resistance is an active member in Prison Hunger Strike Solidarity, a coalition based in the Bay Area. For more information, visit their website. We are currently building an outside strategy to keep solitary confinement in the spotlight. July 8, 2015 was the 2nd year anniversary of the 2013 CA Prisoner Hunger Strikes. To commemorate this anniversary and keep the spotlight on solitary confinement this month, we’ve launched an #AbolishSolitary social media campaign. 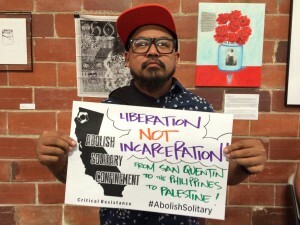 Each day we will be posting an image of an organizer, cultural worker, artist or loved one of a prisoner holding a sign that says “ABOLISH SOLITARY CONFINEMENT” and a reason why/ a demand. Read more here. In 2015 we are extending our strategy in partnership with imprisoned organizers to compel grassroots organizing and advocacy to abolish the use of solitary. To identify potential targets for a long-term campaign, CROak has initiated a letter interview project with people currently or recently imprisoned in solitary confinement; we’ve engaged 60 imprisoned people so far. Members also correspond with hundreds of prisoners each month — building relationships, building the movement and giving much needed support to folks who are locked up. Come to our volunteer night to support and engage! Every Tuesday, 7-9pm. 1904 Franklin St #504, Oakland, CA 94612. Email croakland@criticalresistance.org for info or to RSVP. Since 2010 Critical Resistance Oakland has been an active member of the Stop the Injunctions Coalition (STIC). This strong city-wide coalition fought the use of gang injunctions* and other destructive policing policies in Oakland and built community power as we demanded what we wanted and needed in Oakland instead of more policing. In March 2015 STIC won a full victory against the use of gang injunctions in Oakland! After six years of community pressure that had stalled the injunctions from being expanded or enforced, the City Attorney officially dropped both injunctions from the books. Oakland is the first city in the country to admit defeat on all fronts, dismiss the cases in court, and drop gang injunctions from their toolbox of repressive policing schemes. For more information, visit STIC’s website. Along the way, Critical Resistance, our STIC allies, Communities United for Restorative Youth Justice (CURYJ), and engaged neighbors built the Fruitvale Community Garden, as an example of a life-affirming community resource that STIC was demanding as a real solution to harm and disenfranchisement. The Fruitvale Community Garden became a model for the Oakland Power Projects: how to seed resources that reduce our reliance on policing as the answer to community needs. CR initiated a partnership with All Of Us Or None to work towards REAL safety in Oakland. In our partnership, we articulated demands for more and better re-entry services that welcome people coming home from prison, we called on Oakland to invest in people instead of prisons and policing and we stood up for the rights of Oakland’s youth. Both Critical Resistance and All Of Us Or None shifted the Plan for a Safer Oakland work to the Stop the Injunctions Coalition struggle in 2010. Read more about PSO here.